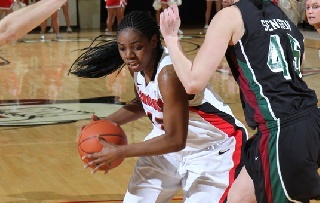 Youngstown State senior Brandi Brown has been recognized on the 2012-13 Capital One Academic All-District Women's Basketball Team for her combined performance on the court and in the classroom, the College Sports Information Directors of America (CoSIDA) announced. Brown will now be part of a vote later this month for Academic All-America consideration. She is one of just five women's basketball players in Ohio, Michigan, Indiana and Illinois to earn Academic All-District honors in the fifth district. Brown, a native of Pomona, Calif., owns a 3.75 grade-point average in communications studies. She earned a 4.0 GPA during the fall 2012 semester and has been voted the Horizon League Scholar-Athlete of the Month for November and December. Brown is also a two-time Academic All-Horizon League selection. She is the first YSU player to earn Academic All-District accolades since Lauren Branson was a second-team pick in 2007-08. No Penguin has ever gone on to be an Academic All-American in women's basketball. Brown was joined on the District 5 team by Kendall Hackney (Northwestern), Amanda Hyde (IPFW), Jenny Ryan (Michigan) and Rachel Tecca (Akron).